Since ancient times, cats have been pets. Ancient civilizations like Egypt used to associate cats with high esteem, and those who caused these small felines harm being penalized by law. Back in ancient times, cat lovers knew that their favorite pets deserved respect and loyalty in order to thrive. Nowadays, cat owners have a vast market to give their beloved pets a warm and welcoming home. Let’s talk about the best As Seen On TV cat scratcher options that will make each day turn into Caturday. As Seen On TV products aren’t always of high quality. It’s always important to be extra cautious when buying something without the ability to test it beforehand. Cat scratchers, in particular, require to be made using pet-friendly materials. So, let’s take a look at a few choices available in this product category and determine which one is the best. TV marketing is based on hype and deals, but these deals sometimes seem a bit too good to be true, right? There’s something ridiculous about As Seen On TV cat scratcher products, as is with all products promoted via the television, right? Ridicule aside, some of these products are legit and are worth discussing, so let’s take a look at the top three best cat scratcher products. What is the Purrfect Arch? It’s a cat scratcher with a twist. The focus of any cat scratcher should be the, well, the scratching, right? This somewhat ingenious and—why not—weird product brings a new dimension to the table. The Purrfect Arch is an interesting take on feline grooming. It’s a cat scratcher base that has an arch brush. No, it’s not an all-powerful brush, it’s a brush shaped like an arch. What it does is that it allows the kitty to self-groom. Everybody knows how hard it is to groom a pet, most especially a cat. Cutting or filing the claws is a nightmare, both for the pet owners and the pets alike. This item will allow the cats to have a stress-free grooming experience that comes in a very advantageous package. The base is decently strong. It also comes with a compartment where the owner can place some catnip so that the cat will have extra motivation to use it. Furthermore, it feels sturdy enough that it will be able to endure all of the abuse that a cat would submit it to. There are a few things that are more straightforward than the Emery Cat Board. From design to marketing, the people at Emery made it as simple as possible for the consumer and their beloved furry pet. The Emery Cat Board is a solution for those owners who don’t have it in them to give pedicures to their kitties. We all know that it is both dangerous and challenging to perform a successful pedicure on a cat since they have nervous terminations halfway through their tiny claws. Because of this, it’s important for owners to provide simpler grooming methods to their furry critters. The Emery Cat Board is a compact, simple-to-use cat grooming device. It has a dense abrasive surface that’s similar to a file, which helps kittens trim and sharpen their own claws. It’s pretty small and has an almost-neutral design. This is a great choice for people who want a small cat scratcher that will get the job done. The Kitty File is a product that’s so insane that it actually makes sense. What, on the surface, is just another cat scratcher becomes a mad scientist’s invention upon close inspection. The Kitty File has a lot of ways to keep the cat entertained and groomed. It’s a one-stop shop experience, to put it in simpler terms. It uses the same type of dense abrasive surface found in other scratchers, but it brings something new to the table. It has a toy. A bird, one of the cat’s natural enemies, which has a laser pointer installed on its beak is included in this cat scratcher. This activates whenever the cat interacts with the matt, enabling it to scratch the material and sharpen its claws. Apart from this insane add-on, it also has all the classic features that any pet owner would want in a cat scratcher—an arched design that can be infused with catnip, among many others. As far as innovation goes, all of these products bring something new to the table. Whether it’s a quirky design or a very portable cat scratcher, anyone can make good use of these self-grooming products. To be honest, the most useful one has to be the The Purrfect Arch. Both straightforward and efficient in design, this item brings two levels of grooming to the table. 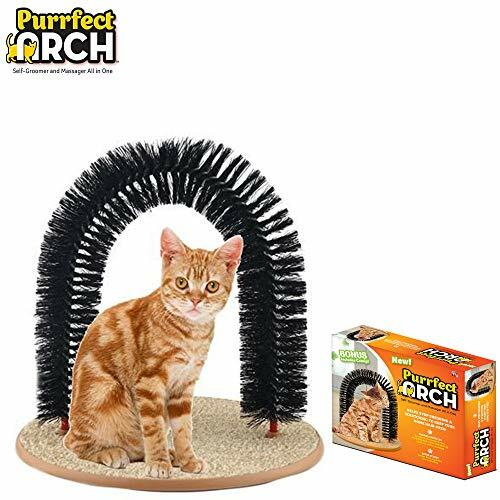 The arch is great for removing any shedding fur from the cat while the base is a good-enough cat scratcher to keep the furniture safe and the kitty moving. That being said, the Emery Cat Board and the Kitty File are both compact and simple in design. These two are definitely better-looking and easier to blend into the surroundings. So, they are probably for pet owners who find it better to go for a less-flashy choice. You can always curl up and watch a street cat named Bob with your feline and spend some quality time bonding. Make sure to order one of the products the next time they’re on air or from each of the manufacturer’s website, they all come bundled with some special offers that are pretty tough to turn down.